At Foxland Cleaning we provide concrete cleaning Canton GA. Our service is one of the best in our area. We have the latest equipment and techniques with the help of which we done our job with 100% customer satisfaction. Techniques we use in our cleaning process includes pressure cleaning, soft Washing and many more that allows us to clean your properties quickly, efficiently and with no risk of harm to structures. Our unique cleaning system is proven to deliver best work by using many different methodologies and innovations. We always make your concrete look its best according to the newest cleaning standards. We bring new change to your building by following our perfect process and using new and improve technologies and methods. 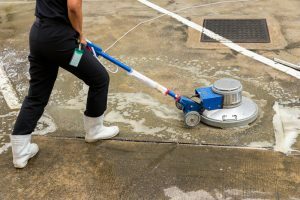 In order to clean concrete, one must first evaluate the stains that are on the material to determine the correct solution to apply. After that, all plants and concrete should be pre-wet in order to prime the area and to protect the plant life. Then we want to apply the solution to the concrete and allow it to dwell an appropriate amount of time. When using solutions, we allow them to dwell on the surface to lift the stain. The next step is pressure washing the concrete with a surface cleaner this will give a more even clean. After that we edge what the surface cleaner can not get then rinse the substrate. Last, we apply a post-solution to whiten and brighten the driveway.